Genomic imprinting leads to maternal expression of IGF2R in both mouse and opossum. 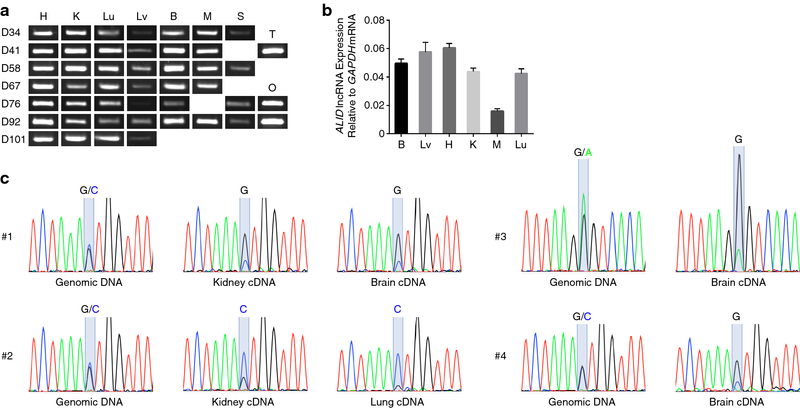 In mouse, the antisense long noncoding (lnc) RNA Airn, which is paternally expressed from the differentially methylated region (DMR) in the second intron of Igf2r, is required to silence the paternal Igf2r. In opossum, however, intriguingly, the DMR was reported to be in a different downstream intron (intron 11) and there was no antisense lncRNA detected in previous analyses. Therefore, clarifying the imprinting mechanism of marsupial IGF2R is of great relevance for understanding the origin and evolution of genomic imprinting in the IGF2R locus. Thus, the antisense lncRNA associated with the marsupial DMR can be considered as the ‘missing link’. In this study, we identified a novel antisense lncRNA, ALID, after detailed analysis of the IGF2R locus in an Australian marsupial, the tammar wallaby, Macropus eugenii, and compared it to that of the grey short-tailed opossum, Monodelphis domestica. Tammar IGF2R showed maternal expression and had a maternally methylated CpG island (CGI) in intron 12 as well as a promoter CGI without differential methylation, but none in the second intron. Re-analysis of the IGF2R of opossum detected the CGI in intron 12, not intron 11, as previously reported, confirming that the DMR in intron 12 is conserved between these marsupials and so is the putative imprinting control region of marsupial IGF2R. ALID is paternally expressed from the middle of the DMR and is approximately 650 bp long with a single exon structure that is extremely short compared to Airn. Hence, the lncRNA transcriptional overlap of the IGF2R promoter, which is essential for the Igf2r silencing in the mouse, is likely absent in tammar. This suggests that fundamental differences in the lncRNA-based silencing mechanisms evolved in eutherian and marsupial IGF2R and may reflect the lack of differential methylation in the promoter CGI of marsupial IGF2R. Our study thus provides the best candidate factor for establishing paternal silencing of marsupial IGF2R without transcriptional overlap, which is distinct from the Igf2r silencing mechanism of Airn, but which may be analogous to the mode of action for the flanking Slc22a2 and Slc22a3 gene silencing in the mouse placenta. Genomic imprinting is an epigenetic mechanism which regulates parent-of-origin-dependent expression of imprinted genes. In higher vertebrates, it has been observed only in mammals and is limited to viviparous mammalian groups, the eutherians and marsupials [1–6] and appears to be absent in the egg-lying monotremes . While more than 100 imprinted genes have been identified in eutherians so far, it has become clear that only small subset of them are also imprinted in marsupials [8–17]. Most imprinted genes are highly expressed in the placenta, and functions of imprinted genes are often associated with placental development and growth, foetal and postnatal development and growth, control of maternal behaviour related to postnatal care and also lactation [3–5, 18]. Therefore, the evolution of genomic imprinting might be correlated with the evolution of mammalian viviparity. The study the divergent evolutionary pathways taken by therian mammals of imprinting mechanism would contribute to understanding how mammals have acquired complex epigenomic regulation because genomic imprinting has been an excellent model revealing many epigenetic mechanisms to control gene expression. The mouse Igf2r locus on chromosome 17 is one of the best characterised imprinted domains which includes the maternally expressed Igf2r, Slc22a2 and Slc22a3 genes and the paternally expressed lncRNA gene Airn [19, 20]. The Airn lncRNA is an established example of a cis-silencing lncRNA essential for the paternal silencing of Igf2r, Slc22a2 and Slc22a3 [21–24]. Airn is transcribed from the maternally methylated DMR located in the Igf2r intron 2 in antisense orientation against to Igf2r [25, 26]. Airn transcription overlaps the Igf2r promoter but not the Slc22a2 or Slc22a3 promoters. Airn transcriptional overlap of the Igf2r promoter, not its lncRNA products, is required for paternal silencing of Igf2r, interfering with RNA polymerase II recruitment to the Igf2r promoter . On the other hand, paternal silencing of Slc22a3 in the placenta depends on the Airn lncRNA products recruiting the H3K9 histone methyltransferase G9a to the Slc22a3 promoter . Thus, Airn has two different modes of action to silence paternal Igf2r and Slc22a3. In humans, adult tissues lack IGF2R imprinted expression [29, 30], but it is found in foetal tissues, placenta, cultured amniotic cells, lymphoblastoid cells and Wilms’ tumours where it is polymorphic [31–34]. The human IGF2R intronic CpG island has promoter activity, and the human orthologue of Airn is present at least in Wilms’ tumours . IGF2R shows imprinted expression also in sheep and dogs, but not in pigs [36–38]. Although the imprinted expression pattern of IGF2R is not identical in these eutherian species, the intron 2 CpG islands are maternally methylated equally. In marsupials, there is maternal expression of IGF2R in the opossum, Monodelphis domestica . However, interestingly, Das et al. found a maternally methylated DMR in opossum IGF2R intron 11 (we argue that it is intron 12, see discussion) not intron 2 and there was no antisense lncRNA found around the opossum IGF2R DMR. Given the presence of marsupial IGF2R DMR at a different genomic location from that of the mouse, studying the imprinting control mechanism in the marsupial IGF2R locus would be of great importance to understand the evolution of genomic imprinting in mammals. Hence, the antisense lncRNA associated with the marsupial DMR can be considered as the ‘missing link’ to investigate imprinting mechanism of marsupial IGF2R unless there is an as yet unidentified lncRNA-independent mechanism that regulates marsupial IGF2R imprinting. In this study, we demonstrate that tammar IGF2R is also maternally expressed and that the CGI located in tammar IGF2R intron 12 is a maternally methylated DMR. Furthermore, we identify a novel paternally expressed antisense lncRNA, ALID (Antisense LncRNA in the IGF2R DMR), which is transcribed from the middle of the tammar IGF2R DMR. Because of the extremely short 650 bp length of ALID compared to Airn, lncRNA transcriptional overlap of the IGF2R promoter, which is essential for the Igf2r silencing in the case of mouse, is likely absent in tammar. This suggests that there is fundamental difference in the lncRNA-based silencing mechanisms between eutherian and marsupial IGF2R. Our study thus provides the most likely candidate factor for establishing paternal silencing of marsupial IGF2R without transcriptional overlap, which is distinct from the Igf2r silencing mechanism of Airn, but may be analogous to mode of action for the flanking Slc22a3 silencing in the mouse placenta. We first searched for polymorphism in the 3′ untranslated region (UTR) of tammar IGF2R to distinguish paternal and maternal alleles. Only single nucleotide polymorphism (SNP) site was found at the very end of the last exon with A/G sequence variation (Fig. 1a). This SNP enabled us to perform restriction fragment length polymorphism (RFLP) analysis by the presence or absence of the CviAII restriction recognition site (Fig. 1a). After CviAII digestion for the PCR products amplified from genomic DNA and cDNA of bilaminar and trilaminar regions of the yolk sac placentae and of fibroblast-like primary cell cultures as well as maternal DNA, the intensity of cut and uncut bands in gel electrophoresis was quantified. Expression of tammar IGF2R was clearly biased to either the A or G alleles that produce uncut and cut bands, respectively (Fig. 1b, c). In the 4 individuals, #1, 3, 5, 6, the A allele predominantly expressed IGF2R mRNA while in the other 4 cases, #2, 4, 7, 8, reciprocally biased expression was observed (Fig. 1b). Of these, the 4 informative cases for maternal genotype, #1, 2, 5, 6, showed that maternal allele was predominantly transcribed. These data demonstrated that tammar IGF2R is also a maternally expressed imprinted gene as in mouse and opossum. Given the imprinting of tammar IGF2R, we next analysed DNA methylation to investigate the possible imprinting mechanism of the IGF2R locus in marsupials. 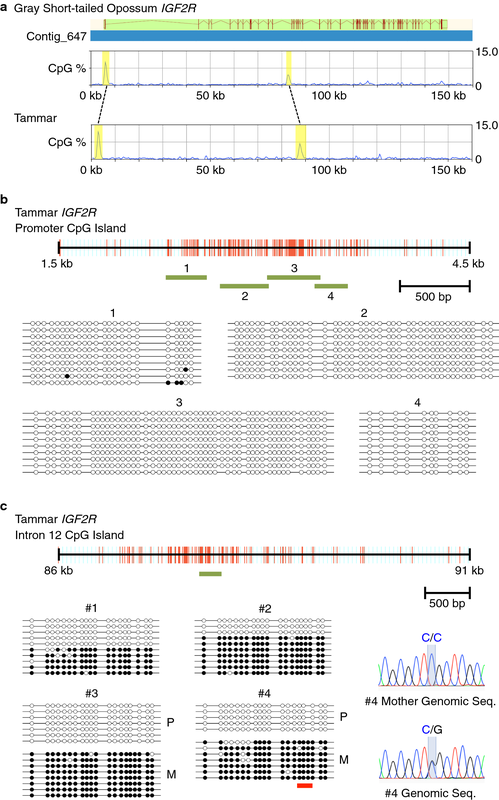 One CGI was located over the putative promoter region of tammar IGF2R, while the other CGI was found in intron 12 at an orthologous position to the opossum intron 11 CGI which forms a DMR (Fig. 2a). Bisulphite sequencing revealed that most CpG sites were unmethylated in almost the entire region of the promoter CGI, suggesting that differential epigenetic modification other than DNA methylation at the promoter region, such as histone modification, regulates maternal expression of tammar IGF2R (Fig. 2b). In contrast, clear differential methylation was observed in the intron 12 CGI (Fig. 2c). The two informative cases having a SNP inside the amplified region enabled us to determine that the methylated allele was maternally transmitted. Thus, it was demonstrated that the intron 12 CGI is a maternally methylated DMR and the putative imprinting control region of marsupial IGF2R. To compare the regulatory mechanisms of IGF2R imprinting between eutherians and marsupials, we examined whether there is any antisense lncRNA which is transcribed from intron 12 DMR similar to Airn of the mouse Igf2r locus. 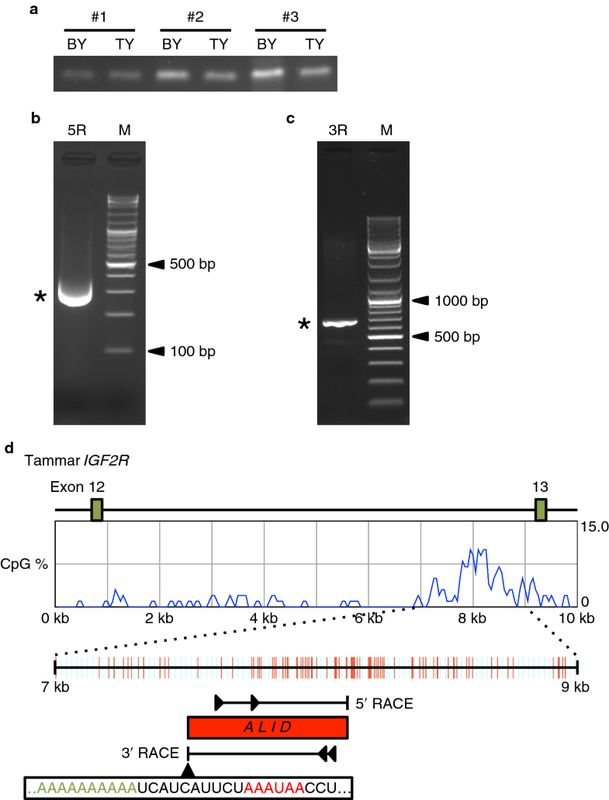 To selectively reverse transcribe antisense transcripts, strand-specific RT-PCR was performed using a reverse transcription primer designed at the upstream region of the DMR in intron 12 in sense orientation against IGF2R (Fig. 3a). The results indicated the presence of any antisense transcripts nearby the DMR, although expression level seemed not to be high in the yolk sac placenta. Hence we next carried out 5′ and 3′ RACE (rapid amplification of cDNA ends) to determine the full-length structure of this antisense transcript (Fig. 3b, c). Sequencing the nested 5′ RACE product, it appeared that the transcription start site (TSS) of the antisense transcript was located in the middle of the DMR, suggesting that this antisense transcript is the marsupial equivalent to murine Airn (Fig. 3d). Combining the data of 3′ RACE, it was revealed that this antisense transcript is approximately 650 bp long with a single exon structure and no obvious protein-coding potential. A typical polyadenylation signal was located before the polyA tail, suggesting the result of 3′ RACE was not an artefact (Fig. 3d). Thus, we named this antisense lncRNA ALID. We confirmed expression of ALID in a range of tissues from developing young by both conventional PCR and strand-specific reverse transcription followed by qPCR. ALID was ubiquitously expressed in various stages of tammar pouch young although there was some degree of difference in expression levels between tissues (Fig. 4a, b). The imprinting status of ALID was determined by direct sequencing of strand-specific RT-PCR products that contain a SNP site. In contrast to the data of genomic DNA PCR products in which double peaks at SNP site have almost the same signal strength, the data of RT-PCR products clearly showed that ALID is predominantly expressed from either one of the two alleles (Fig. 4c). Remarkably, in the data of individual #2, the expressed allele was opposite to the data of #1 and #4, showing that the monoallelic expression observed in these data was not consequence of simple allelic difference but reflected the parental origin. DNA methylation analysis of the nearby genomic region including these SNP sites showed that the expressed alleles were unmethylated alleles (data not shown), demonstrating the paternal expression of ALID lncRNA. In this study, we identified a novel antisense lncRNA, ALID, analysing the IGF2R locus in an Australian marsupial, the tammar wallaby and compared it to that of opossum. We first clarified that both maternal expression and DMR of IGF2R were conserved between tammar and opossum. Confirming the evidence of the downstream DMR in IGF2R of an Australian marsupial is important to ensure the previous finding in opossum because the data of differential methylation was provided from only a single sample in the opossum study. According to the report by Das et al., the opossum IGF2R DMR was located in intron 11 . However, the two exons neighbouring the tammar IGF2R DMR were exon 12 and 13 that are orthologous to exon 12 and 13 in both mouse and human IGF2R. Because all the orthologous exons of the main transcript of mouse and human IGF2R are found in both tammar and opossum genomic sequences and the tammar and opossum IGF2R DMRs were clearly located to the orthologous position, we conclude that the marsupial IGF2R DMR is present in intron 12 not 11. While the downstream CGI in tammar IGF2R intron 12 was maternally methylated, the promoter CGI was entirely unmethylated despite maternal expression of tammar IGF2R. This observation provided good agreement with the previous work in opossum , suggesting that other differential epigenetic modification than DNA methylation such as differential histone marks on the IGF2R promoter region is responsible for the paternal silencing of marsupial IGF2R. In our allelic expression analyses, there is some level of leaky expression from the repressed paternal alleles detected in all the samples examined. This might be the result of repression of the paternal tammar IGF2R promoter by DNA methylation-independent epigenetic mechanism because similar leaky expression from the repressed allele was also observed in some imprinted genes in both marsupials and eutherians that are regulated by differential histone modifications without DNA methylation [9, 11, 41]. We also identified an antisense lncRNA transcribed from the middle of the tammar IGF2R DMR which is located in intron 12 and named it ALID. ALID was predominantly expressed from unmethylated alleles, indicating its paternal expression. Thus, despite the non-orthologous location of DMRs between mouse and tammar, Airn and ALID share a common feature that both are paternally expressed from the middle of DMRs. However, surprisingly, the length of ALID was extremely short ~ 650 bp, compared to Airn length which is more than 100 kb . This result is consistent with the strand-specific RT-PCR experiments performed in the previous study in opossum which did not detect any antisense transcript, because the position of all the primers used in their strand-specific RT-PCR experiments was too far from the DMR to detect this short transcript . We fortunately detected ALID in this study because the primer position was designed closer to the middle of DMR where we presumed that the transcription start site exists. 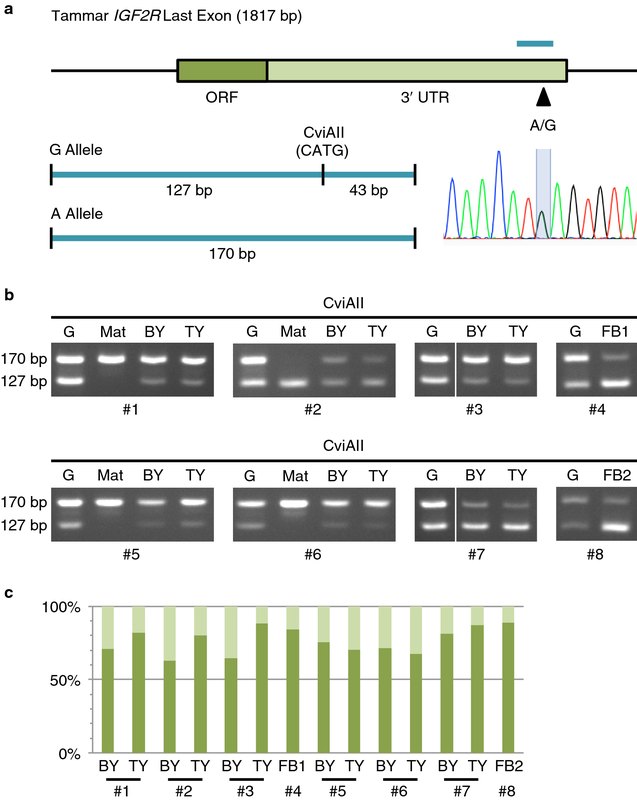 The short length of ALID suggests certain critical differences exist in the regulatory mechanisms of IGF2R imprinting between mouse and tammar. Murine Airn transcriptionally overlaps with the Igf2r promoter and this transcriptional overlap, but not the lncRNA product itself, is crucial for paternal Igf2r silencing , while tammar ALID does not overlap with the IGF2R promoter due to its short length and the much more downstream intron 12 location of DMR, suggesting the marsupial IGF2R imprinting mechanism does not require the promoter overlap unlike the murine case. While the promoter overlap with Airn is critical for Igf2r imprinting, the two adjacent genes Slc22a2 and Slc22a3 that are imprinted only in the placenta do not require promoter overlap with Airn . It is thus possible that the mechanism regulating marsupial IGF2R imprinting is similar to the promoter overlap-independent silencing mechanism regulating imprinting of Slc22a2 and Slc22a3 in the mouse placenta. Alternatively, there is a possibility that an as yet unknown very long form of ALID is expressed only in a certain developmental window in early embryonic stages and makes transcriptional overlap with IGF2R promoter. After the establishment of epigenetic silencing of paternal IGF2R, the structure of ALID may be changed to the short form, which would be functionless in this case. Interestingly, we found that the length of the IGF2R intron 12 has been largely extended specifically in marsupial species (Fig. 5a), while no such clear difference was observed for the intron 2 lengths among multiple species. This phenomenon is most likely linked to the marsupial-specific acquisition of the intron 12 DMR. Hence, it is simple to hypothesise that the intron 12 DMR emerged in the common ancestor of marsupials rather than that it has occurred in the common therian ancestor and only eutherians have lost it after the divergence of marsupials. Then, was the emergence of the intron 12 DMR de novo acquisition of imprinting to IGF2R or not? This question is important to discuss if the IGF2R locus had two independent origins of imprinting or just the once. We provide two simple models for the evolution of IGF2R imprinting as it is difficult to conclude the most likely hypothesis currently (Fig. 5b). 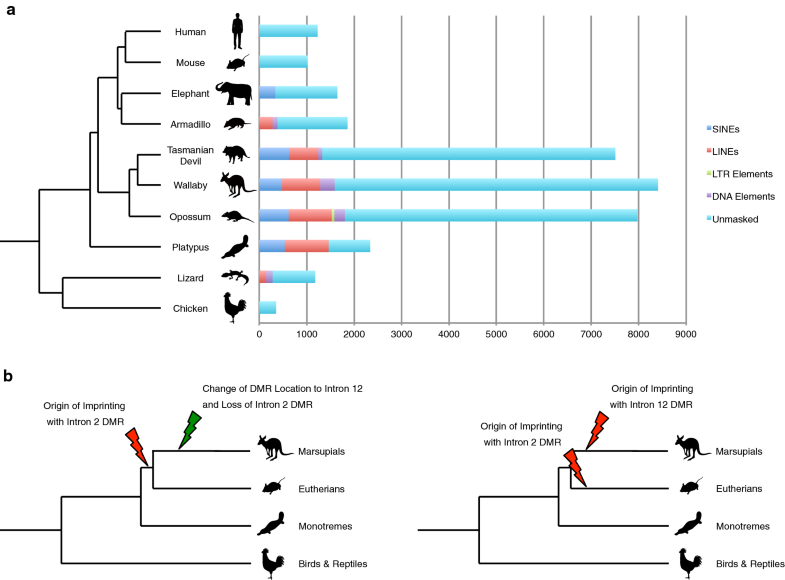 The first possibility is based on the idea that the origin of imprinting of the IGF2R locus occurred just once in the common therian ancestor while the change of DMR location to intron 12 and consequent loss of former DMR in intron 2 subsequently occurred in the marsupial ancestor (Fig. 5b left). Alternatively, the acquisition of IGF2R imprinting might have independently arisen separately in both the eutherian and marsupial ancestors (Fig. 5b right). In this study, we provide the most likely lncRNA candidate factor for establishing paternal silencing of marsupial IGF2R without transcriptional overlap, which is distinct from the Igf2r silencing mechanism of Airn, but may be analogous to the mode of action for the flanking Slc22a2 and Slc22a3 silencing that occurs in the mouse placenta. 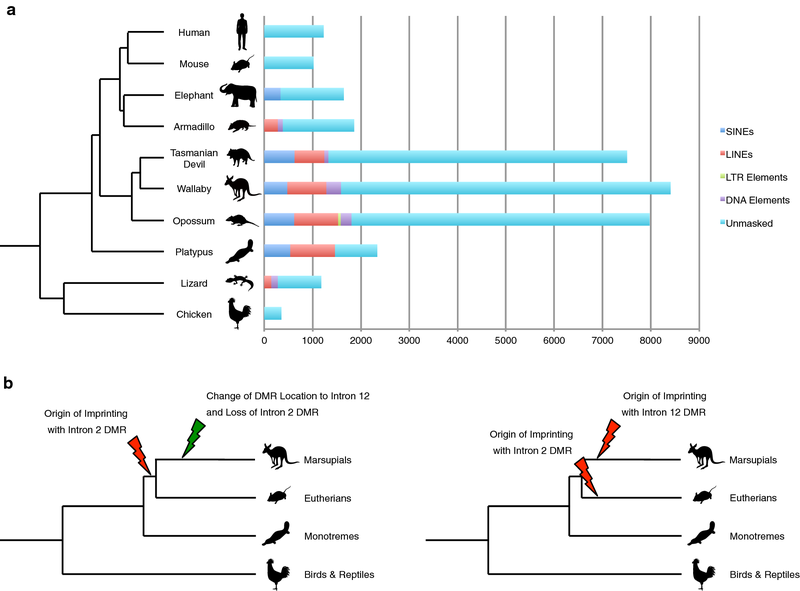 Although we clarified that a novel DMR in intron 12 emerged in the common ancestor of marsupials, it is still unclear whether this event was due to a change of DMR location or de novo acquisition of IGF2R imprinting. Both scenarios represent the extraordinary history of this imprinted locus. The former scenario would provide the first evidence of the change of DMR location in any imprinted domains, and the latter scenario would be the first example of two independent origins of genomic imprinting for the same gene, suggesting extremely strong positive selection for IGF2R imprinting during mammalian evolution. Tammar wallabies of Kangaroo Island origin were maintained in our breeding colony in grassy, outdoor enclosures. Lucerne cubes, grass and water were provided ad libitum and supplemented with fresh vegetables. Yolk sac placenta tissues were collected between days 21 and 26 of the 26.5 days gestation as previously described [43, 44]. Pouch young between days 34 and 101 postpartum were dissected to obtain a range of tissues. Experimental procedures conformed to Australian National Health and Medical Research Council (2013) guidelines and were approved by the Animal Experimentation Ethics Committees of the University of Melbourne. The 3′ UTR of IGF2R, including the polymorphism on the CviAII recognition sequence, was amplified by 35 cycles of RT-PCR. The PCR products were digested with 1–5 units of CviAII for 3 h at 25 °C. The digested PCR products were resolved by gel electrophoresis. The intensity of the cut and uncut bands was quantified with ATTO CS Analyzer 3 software (ATTO). Primer sequences used in this study are provided in the Additional file 1. Genomic DNA was extracted from yolk sac placentas using Trizol (Life Technologies). Genomic DNA was treated with sodium bisulphite solution, as described previously [45, 46]. After the bisulphite treatment of the genomic DNA, 35 cycles of PCR were carried out using the primers designed by MethPrimer . The PCR products were cloned using a pTAC-2 vector (BioDynamics Laboratory) and ECOS-competent Escherichia coli DH5α (NIPPON GENE). Plasmids were purified using FastGene Plasmid Mini (NIPPON Genetics) and sequenced. The sequence data were analysed by QUMA (quantification tool for methylation analysis; http//quma.cdb.riken.jp) . Primer sequences used in this study are provided in the Additional file 1. Total RNA was extracted from yolk sac placentas and a panel of pouch young tissues using Trizol (Life Technologies) as instructed by the manufacturer. Total RNA was treated with DNase I to remove genomic DNA (Promega, M6101). cDNA was synthesised using a Transcriptor First Strand cDNA Synthesis Kit (Roche) with the primer designed in the intron 12 DMR in sense direction for IGF2R. There was no amplification from the minus RT controls detected for any of the RNA samples examined in this study. Thirty-five cycles of PCR amplification were carried out in 10 µl total volume with 10 ng cDNA using 0.2 U TaKaRa Ex Taq HS (TaKaRa), 4 pmol of each primer and 2 nmol of each dNTP mixture under the following cycle condition: 96 °C for 15 s, 60 °C for 30 s and 72 °C for 30 s. PCR products were resolved by gel electrophoreses. Primer sequences used in this study are provided in the Additional file 1. To determine the complete structure of ALID, we performed 5′ and 3′ RACE experiments using a SMARTer RACE 5′/3′ Kit (Clontech) according to the manufacturer’s instructions. The RACE products amplified from the templates created using pouch young brain RNA were cloned using a pTAC-2 vector (BioDynamics Laboratory) and ECOS-competent Escherichia coli DH5α (NIPPON GENE). Plasmids were purified using FastGene Plasmid Mini (NIPPON Genetics) and sequenced. Primer sequences used in this study are provided in the Additional file 1.
cDNA was prepared as described in the strand-specific RT-PCR section. Quantitative real-time polymerase chain reaction (qPCR) was carried out in triplicate in 10 µl volumes containing 25 ng cDNA, 5 nM of the primers and FastStart Essential DNA Green Master (Roche) using LightCycler 96 (Roche). The amplification efficiency was calculated from the standard curve. GAPDH was used as the reference gene, and the data were analysed by Microsoft Excel. Primer sequences used in this study are provided in the Additional file 1. SS performed the experiments and analyses and was a major contributor in writing the manuscript. MBR and GS collected the tissues and contributed to the writing and editing of the manuscript. All authors contributed to the study design. All authors read and approved the final manuscript. We thank Yasuko Hayashi for technical assistance. Experimental procedures conformed to Australian National Health and Medical Research Council (2013) guidelines and were approved by the Animal Experimentation Ethics Committees of the University of Melbourne. This work was supported by the Ministry of Education, Culture, Sports, Science and Technology (MEXT) in Japan, Program to Disseminate Tenure Tracking System (individual selection type) to SS and Australian Research Council (ARC) Discovery Project to MBR, GS and SS. 13072_2018_227_MOESM1_ESM.docx Additional file 1. List of primer sequences.